We were honored once again to work on another Paul Kirk house remodel this last year – this one in the Innis Arden neighborhood just north of Seattle. The mid-century home is set on a high slope with panoramic views of Puget Sound over beautifully landscaped gardens. 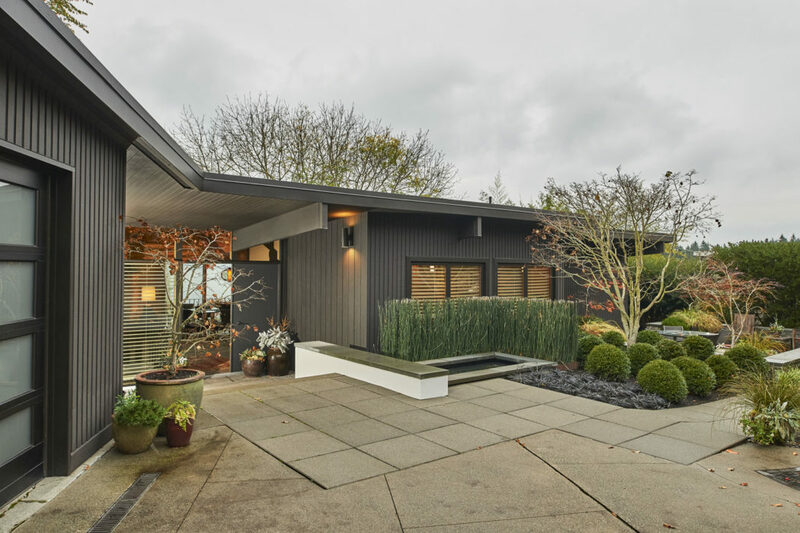 As we’ve mentioned in our mid-century blogs, Paul Kirk was a much-lauded and classic, mid-century Seattle architect, setting the bar for quintessential Northwest-style residential architecture in the 50’s and 60’s. This home is one of the best and intact examples of his work we’ve seen. The heavy-timber post and beam structure of the house is clearly expressed both inside and out with huge sheets of glass between all structural elements, including transom windows continuing right up to the tongue and groove ceiling. The west-facing side of the home is nearly fully glazed, allowing a plentiful supply of natural light into the home and letting out onto patios that sweep into the landscape; all elements of a classic and elegant Northwest-style home. With full appreciation of the original architectural intentions, our client has a long list of areas within the house that need refreshing; we have started here with a Master Suite remodel, working within one end of the existing home. Our remodel included a new master bath, enlarged master bedroom with adjacent sitting room, and a new powder room. We also changed out all of the exterior (single-glazed!) windows and sliding doors to double-glazed units and much larger sliding patio doors, all carefully detailed so as not to take on a bulkier look inherent with newer window products. The new glazing units also will lower the solar heat gain the house experiences with the western sun and will perform more much efficiently with the existing systems of the home. 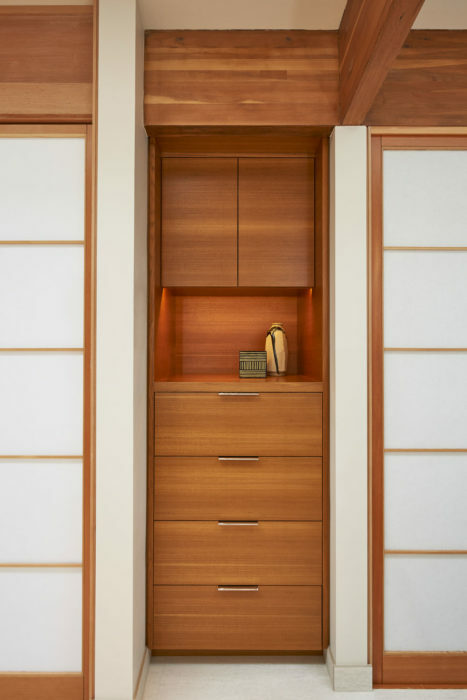 Our client has a lovely collection and appreciation for Japanese antiquities, which led to our choice of sliding shoji screen doors in key locations within the house. 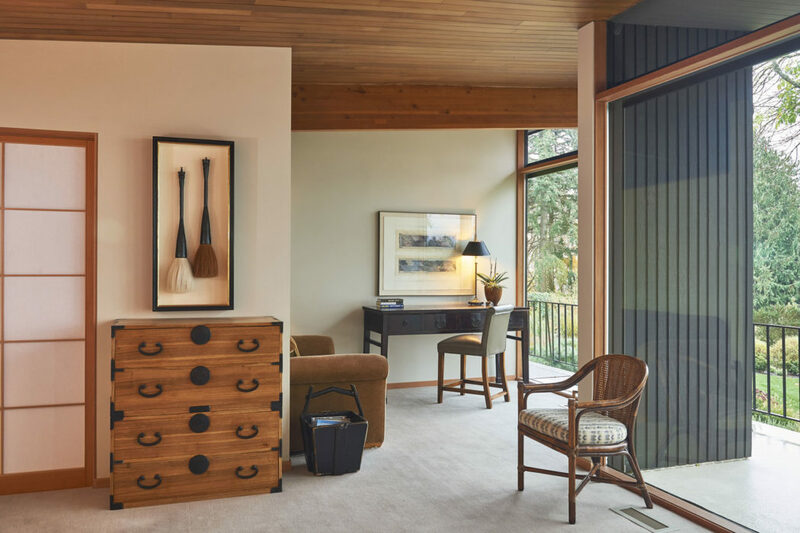 Given the importance of Japanese influence on NW regional mid-century architecture, the doors fit in nicely with both the aesthetic of the home and the original design intent. 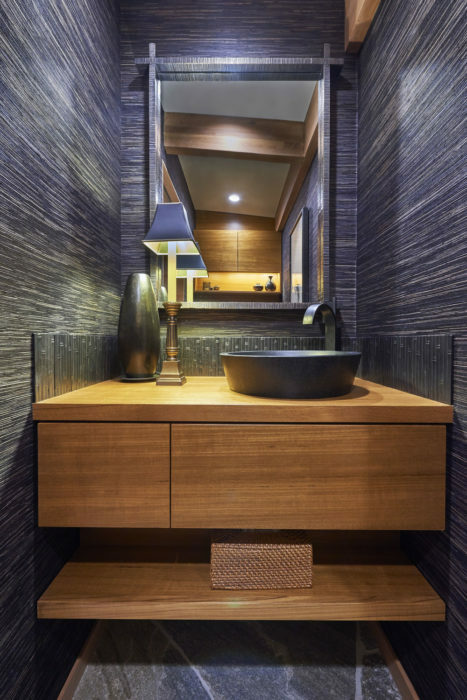 The shoji screen panels allow for soft light transmittance from room to room, delicately engaging the separate spaces. The overall quality of this remodel is one of tranquil and muted restraint, highlighting the simple structure of the house. 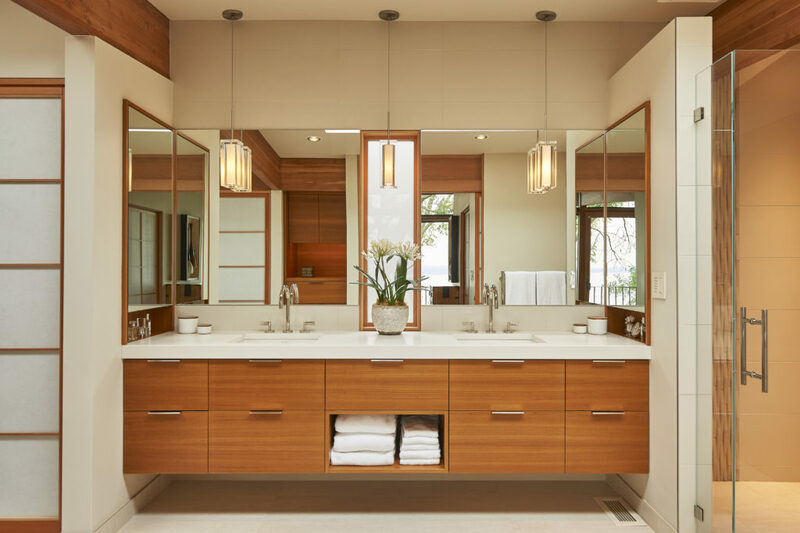 Care was taken at every step of the design process to ensure a cohesive result from the location of additional two windows to the sink selections, including a beautiful stone basin in the powder room. A limited palette of natural materials, including the original stone floors, grasscloth, and teak and fir accents, allows for the focus to be on the breath-taking northwest light and landscape throughout this gorgeous home. For more photos of the completed project, see our Remodels page.